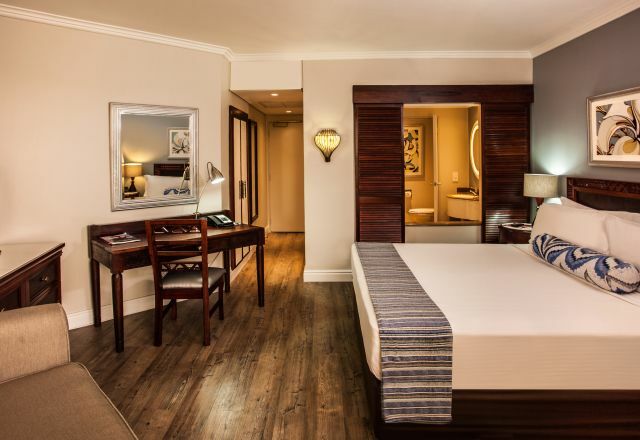 Perfect for an extended stay in the city or for post-safari luxury, Executive Rooms at Southern Sun Dar es Salaam feature extra space and extra comforts. A spacious and comfy King size bed, air-conditioning, pool and garden views, as well as daily turndown, bathrobes and slippers adds to the comforts that make the Executive rooms a favourite Dar es Salaam room choice. WiFi is complimentary and ready for multi-devices, bathrooms feature a bath and shower with sliding-shutters that adds to the open-plan appeal of the room. Lounge chairs, flat-screen TV with plenty of local and international channel choices, mini-bar and 24-hour room service makes it easy to hideaway whether you’re here for a romantic city-break or distraction-free business meetings. Executive Rooms at our Dar es Salaam accommodation have a work desk and en-suite bathroom with bath and shower.